A sharp drop in US10Y bond yields and the US dollar index. US10Y bond yields dropped from 3.24% to 3.16%. In Asia, they dropped further to 3.14%. The decline of the US stock market. Investors have been selling shares across all industries as interest rate hikes from the US Fed make bonds attractive when the stock market is overheated. The Brexit deal is about 80 – 85% complete and could be finalised by Wednesday the 17th of October. This is according to chief EU negotiator Michel Barnier. The pound is rising across the board. The EURUSD and GBPUSD pairs are moving in the same direction. 14:30 Eurozone: ECB monetary policy meeting accounts. 15:30 Canada: new housing price index (Aug). 15:30 US: CPI (Sep), initial jobless claims (5 Oct). 18:00 US: EIA crude oil stocks change. 21:00 US: Federal budget balance (Sep). Above I’ve laready listed the potential factors behind the euro’s rise. The rate rose to the 90th degree yesterday, before pushing further to the 112th today. As far as I see it, the 112 – 135 degree range is a reversal zone, but I didn’t manage to open a short position from 1.1565 in time. We’ll have to wait and see how the situation develops. Oil prices collapsed yesterday, which took its toll on commodity currencies. The oil market faded to the background, however, following the decline in US bond yields. Speculators may return to it now, having remembered yesterday’s decline. Our pair fell from a high of 1.1572 to 1.1548. 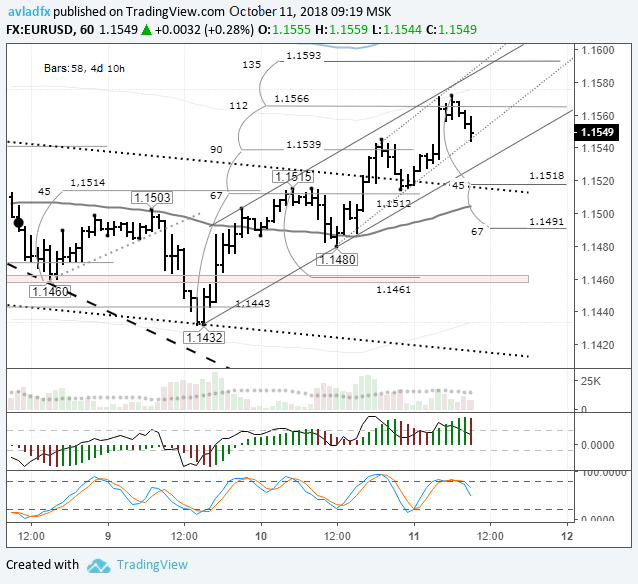 Sellers are holding the rate up at the trend line drawn from 1.1432. On the current hour, this line runs through 1.1530. Taking into account the 3 consecutive higher highs on the AO indicator, it’s possible that trend line will be broken. If the rate makes it to 1.1548, sellers will have a head and shoulders model within their sights. At this point it won’t matter so much whether or not it’s a true H&S formation. The real question is how many traders will spot the formation and how much money they’ll put on it. If the model forms, the rate will return to 1.1475. So, we’ve looked at the potential factors for a drop; now let’s look at the growth factors. If the rate rebounds from the trend line, then against the backdrop of a broadly weaker dollar and a decline in US10Y bond yields, the bulls could test the 135th degree. From there we’ll head south again, since there’s a bearish divergence forming between the rate and the AO indicator. The euro is rising against the dollar amid some sharp pullbacks. It’s as if markets are intentionally delaying buyers to make them believe in this new rally and to activate short limit orders on the euro. The current reversal has been confirmed on the daily timeframe. Now we need to test sellers’ intentions with a drop. If bearish activity is low, then following the correction, the rate will move up to 1.1650 and beyond.